If you’ve ever wanted to provide a demo to go alongside your paid game you may of had to employ some workaround such as creating a separate page or just making a link in your description to a download URL. Starting today itch.io has the ability to host your demos. From the file uploader on the edit game page you can now mark a file as a demo. 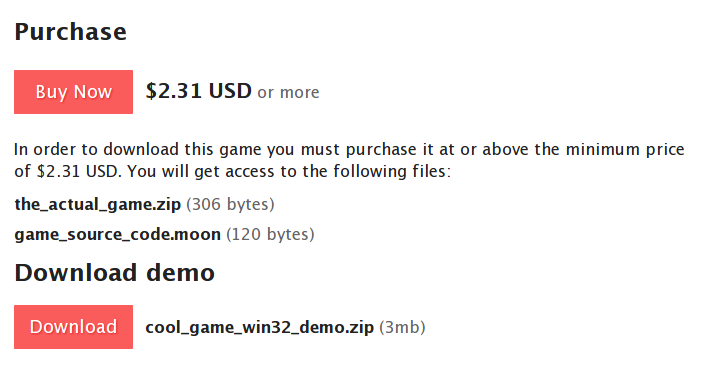 Files that are demos are listed below the buy button on your game page and are immediately downloadable. Like all other files you can upload, demos will have download analytics collected and shown in the game analytics page so you can see how your files are being downloaded. if i already have a game with a downloadable file, how do i set it to be the free demo and switch the game over to paid along with the upload of a new download file for the full version of the game? was this replaced by the "set a different price for this file" feature? do i simply set the demo price to zero? also somewhat related, is there an option for a maximum price so people don't feel pressure to tip me? i'm still confused, because on the Edit Game page, i don't see the word "demo" anywhere. i don't see a checkbox labeled "This is a demo" or an option for "This file is a demo and can be downloaded for free". has this feature changed since you posted this info? as a result, i'm still having trouble, although the solution might be right in front of me simply labeled differently.